Rule 237B.2 You never want the mast to go but once you realize it’s going you want it gone baby gone. Rule 237B.3 When you drive in to a regata in México and you’re passing Federale trucks with mounted machine guns, El Presidente, Felipe Calderón, really did show this time. Rule 237B.4 When they tell you how helpful the Mexican Navy has been standing station at anchor for three days at Punta Mita to finish the San Diego-Puerto Vallarta fleet (because the yachties didn’t want to), and they tell you the Navy will be there for you if needed, don’t assume you won’t need. 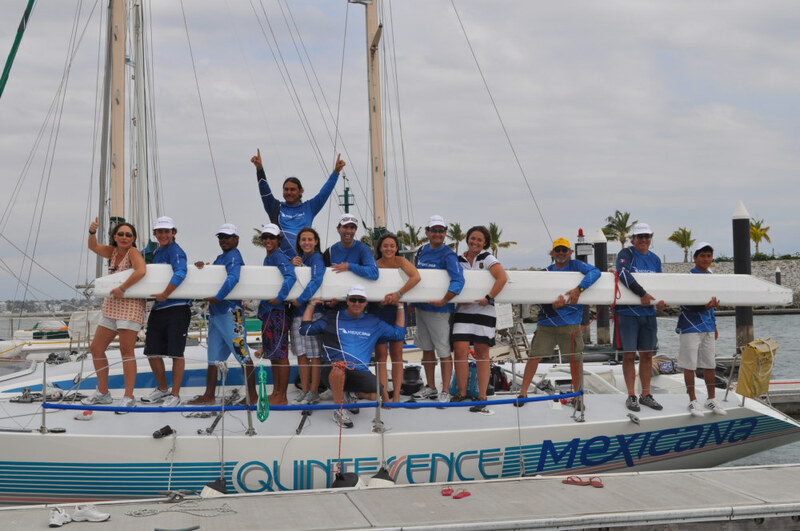 Regata Copa México opened on Sunday out of La Cruz de Huanacaxtle, on Bahia de Banderas, which I will say for the umpteenth time is one of the best places in the world to sail. The two-week regatta celebrates the country’s bicentennial and includes racing for J/24s, windsurfers and kites, along with (hey, baby) beach volleyball. 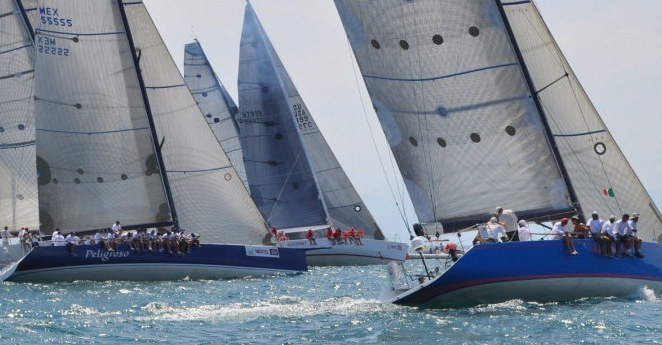 But the backbone of the regatta is that it incorporates MEXORC, the region’s classic keelboat event that always tags into a race from the U.S.
John MacLaurin had his new Davidson 69, Pendragon VI, on the course—the one that dropped out of the PV Race and put into Cabo with rudder issues—but from my distant view I’d say they’re still teething and no surprise. It was a race to the race, just to be here, and MacLaurin has talented people on the case, but it was a pretty big ask. The sort of thing that, had it been a Transpac, you would have just hit the Off switch. The man has been a stalwart supporter of this event, and he wanted to be here with his new boat, not his old boat, and I reckon that’s pretty danged human. I spent my day aboard Quintessence with the family Saenz, heirs to one of the great names in sailing, and I saw something. 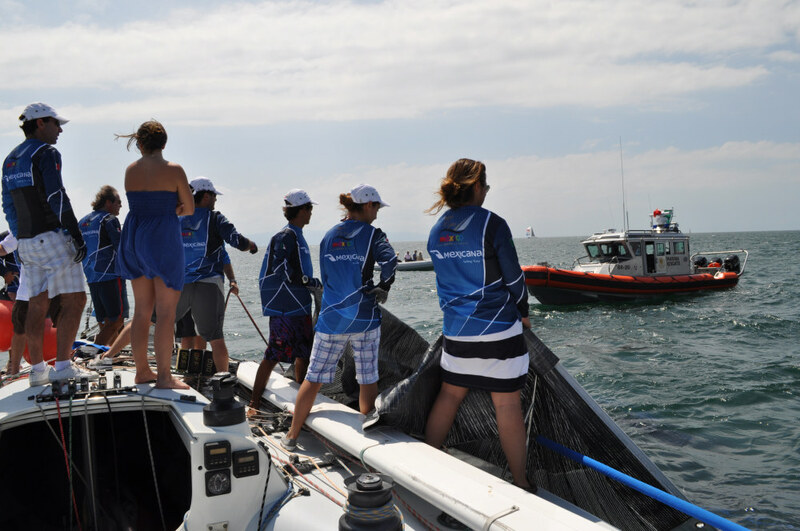 I can’t say as how I saw the mast come down, only minutes after our braintrust of Eduardo Saenz and American sailmaker Bruce Cooper nailed the start, and nephew Fede acknowledged the congratulatory wave of el Presidente . . . But I heard that sucker crack, you better believe it, and as the deck leveled out I knew all too well what I was going to see when I looked. Or not see. Mast down. Blood on the deck was an open question, but there was none of that, so I can come back to broken masts later. When I say that I saw something, what I saw resonates because I recently read Nicholas Hayes’ book, Saving Sailing, which is at heart an indictment of our society for separating the activities of the generations and sterilizing sport and losing the spirit of mentoring and sharing that has nurtured countless generations. 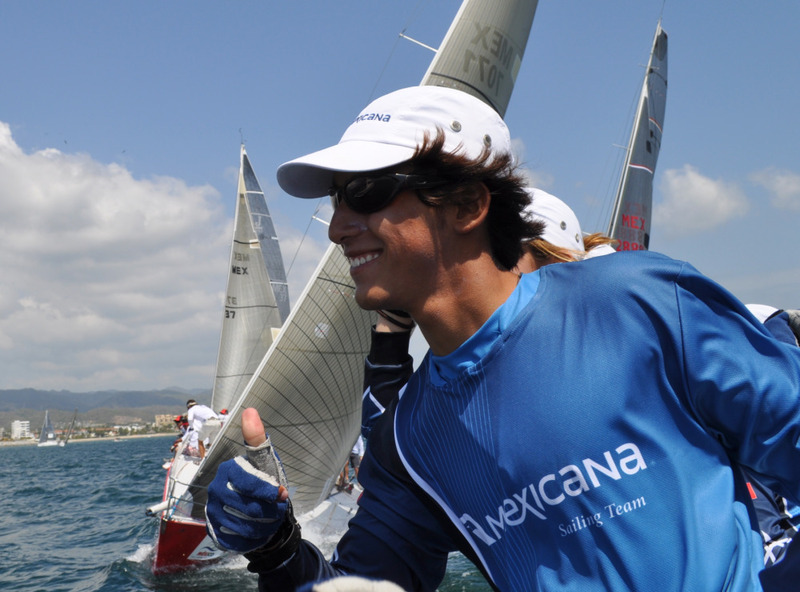 But sport in Mexico is a family affair, whether it’s skiing (with a passion) or sailing (with a passion). The Saenz family has more history than most when it comes to sailing, but in making it a family affair they are more typical that exceptional. I counted eight family members aboard, plus one friend, one ringer, four paid hands, and a wandering scribbler who by the end of the day had fallen in love with their warmth, vitality and bounce-back. 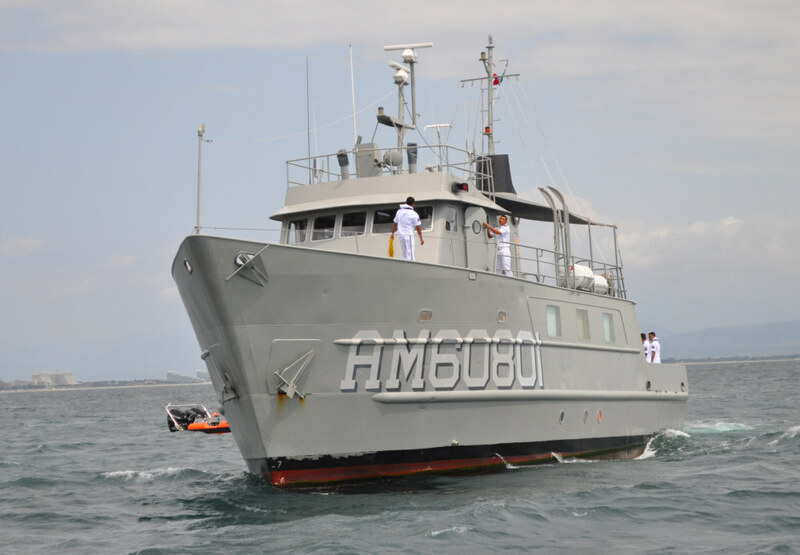 In Mexico, they don’t talk about “saving sailing.” In fact, Presidente Calderón owns a boata Catalinathat he keeps in Acapulco, and he has his Navy buying sailboats for Naval bases because he wants the enlisted personnel to learn how to sail. He wants to take this vertical, in other words, beyond the elite that have been comfortably international and sailing for generations. 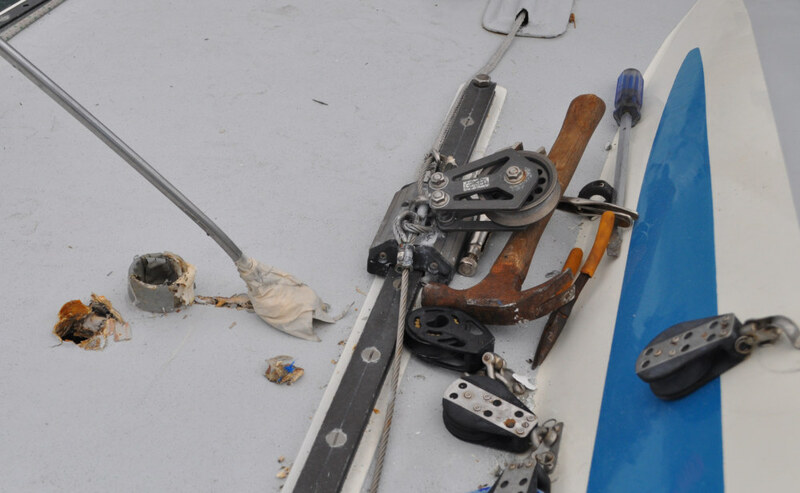 I saw tears on Sunday, I saw smiles in recovery, and you know it’s a hard day when there are hammers hammering on the foredeck and a call for “another hacksaw” and Becky, the wife of Eduardo Saenz, speaks of “two years of dreaming and planning” gone with the mast. And this was leg one of race one. Hangin’ onto stuff. That’s the Mexican Navy standing by to starboard, and to port . 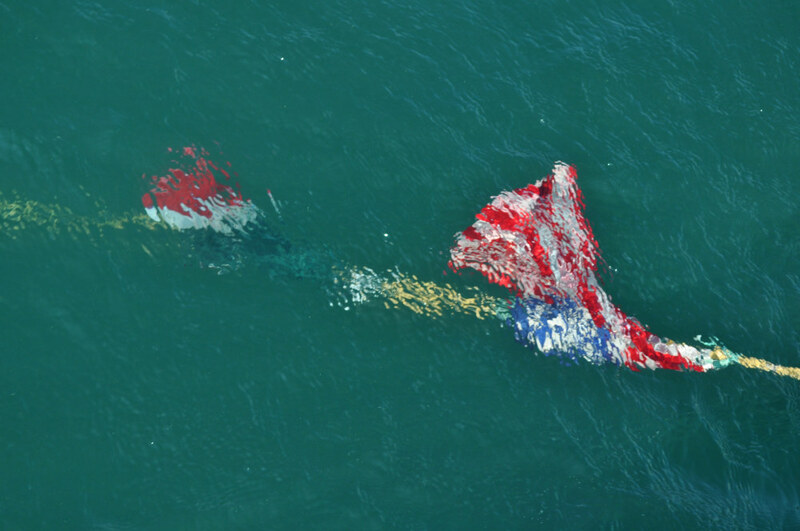 . .
Submerged (but later rescued) the flags of the two countries . . . It was “interesting” that even though this incident tested the meaning of tragedy for the Saenz family, these images don’t capture that. I didn’t take the picture of Robi crying; it felt invasive. Later, Becky told me, “Photograph everything. My children will remember this forever.” So she gets a flash drive with 479 files. Their home territory, Acapulco Yacht Club, preserves the greatest fleet of IOR boats still racing, Quintessence being one example. These boats are babied. All of them have professional maintenance, and they’re even drysailed. Acapulco Yacht Club has a new, heavy-duty lift that makes light work of the likes of Quintessence, a 1980’s Reichel-Pugh that was re-moded for what Acapulco sailors think of as the “heavy winds” of Bahia de Banderas. It’s generally very light in Acapulco, so 10-14 in Bahia de Banderas has its own dimension. Extra lead was added as internal ballast. Rival Wasabi added a 400-kilogram lead bulb. Plenty of racing remains, except for Quintessence. There was a lot riding on this, and then there wasn’t. As dismasting-emergencies go, we had moderate breeze, moderate waves, and daylight. We even had a race committee volunteer who came aboard and more than pulled his weight figuring out the dis-engineering details. But this minor incident in yachting will loom large in the history of the family Saenz, which is exactly what makes it important. Few of us are ever more than one turnbuckle away from failure . . .
Did I mention, two years of dreaming and planning? Now the boat is broken, far from home, meaning who knows how many tweaks to this other expectation or that. For starters, you don’t just ask the boys to motor down the coast. But I saw something on that day. I saw a family rally as family. Earlier in this missive, the word “tragedy” floated through, but of course this was not a tragedy. Without body parts flying, a broken mast is frightening. Disappointing, even tragic, perhaps, on a conversational scale but not as measured in the scales of the New Testament. Instead, the end of the day looked like this, bittersweet . . . Thus, eventually, la familia Saenz et al were ready to record this image for the family history. Not their favorite moment. Not their perfect moment. But all theirs.